A Wizard of Earthsea is a young adult fantasy novel written by the American author Ursula K. Le Guin, first published by the small press Parnassus in 1968. The novel received highly positive reviews, initially as a work for children, and later among a general audience as well. Set in the fictional archipelago of Earthsea, the story centers around a young mage named Ged, born in a village on the island Gont. Displaying great power while still a boy, he joins the school of wizardry, where his prickly nature drives him into conflict with one of his fellows. During a magical duel, Ged's spell goes awry and releases a shadow creature that attacks him. The novel follows his journey as he seeks to be free of the creature. The book has often been described as a Bildungsroman or coming of age story, as it explores Ged's process of learning to cope with power and come to terms with death. The novel also carries Taoist themes about a fundamental balance in the universe of Earthsea, which wizards are supposed to maintain, closely tied to the idea that language and names have power to affect the material world and alter this balance. Although the structure of the story is similar to that of a traditional epic, critics also described it as subverting this genre in many ways, such as by making the protagonist dark-skinned, in comparison to more typical white-skinned heroes. A Wizard of Earthsea is widely regarded as a classic of fantasy and young-adult literature and was one of the final recipients of the Lewis Carroll Shelf Award. The book was widely influential within the genre of fantasy; Margaret Atwood, for instance, called A Wizard of Earthsea one of the "wellsprings" of fantasy literature. Le Guin would later write five subsequent books that, together with A Wizard of Earthsea, are referred to as the Earthsea Cycle: The Tombs of Atuan (1971), The Farthest Shore (1972), Tehanu (1990), The Other Wind (2001), and Tales from Earthsea (2001). George Slusser has described the series as a "work of high style and imagination". Early concepts for the Earthsea setting were developed in two short stories, "The Rule of Names" (1964) and "The Word of Unbinding" (1964), both published in Fantastic. The stories were later collected in Le Guin's anthology The Wind's Twelve Quarters (1975). It was also used as the setting for a story Le Guin wrote in 1965 or 1966, which was never published. In 1967, Herman Schein (the publisher of Parnassus Press and the husband of Ruth Robbins, the illustrator of the book) asked Le Guin to try writing a book "for older kids," giving her complete freedom over the subject and the approach. Drawing from her short stories, Le Guin began work on A Wizard of Earthsea. Le Guin has said that the book was in part a response to the image of wizards as ancient and wise, and to her wondering where they come from. Le Guin later said that her choice of fantasy as a medium, and of the theme of coming of age, was a product of her writing for adolescents. The short stories published in 1964 introduced the world of Earthsea and important concepts in it, such as Le Guin's treatment of magic. It also introduced Yevaud, a dragon who featured briefly in A Wizard of Earthsea. Le Guin's depiction of Earthsea was influenced by her familiarity with Native American legends as well as Norse mythology. The influence of Norse lore can be seen in the characters of the Kargs, who are blonde and blue-eyed, and worship two gods who are brothers. Le Guin's belief in Taoism is also visible in the idea of a cosmic "balance" in the universe of Earthsea. Le Guin originally intended for A Wizard of Earthsea to be a standalone novel, but she decided to write a sequel after considering the loose-ends in the first book, and wrote a third book after further consideration. Earthsea itself is an archipelago or group of islands. In the fictional history of this world, the islands were raised from the ocean by Segoy, an ancient deity or hero. The world is inhabited by both humans and dragons, and several among the humans are sorcerers or wizards. The world is shown as being based on a delicate balance, which most of its inhabitants are aware of, but which is disrupted by somebody in each of the original trilogy of novels. The setting of Earthsea is preindustrial, and has many cultures and within the widespread archipelago. Most of the characters of the story are of the Hardic peoples, who are dark-skinned, and who populate most of the islands. Some of the Eastern islands are populated by the white-skinned Kargish people, who see the Hardic folk as evil sorcerers: the Kargish, in turn, are viewed by the Hardic as barbarians. 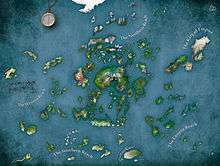 The far western regions of the archipelago are where the dragons live. The novel follows a young boy called Duny born on the island of Gont, nicknamed "Sparrowhawk". Discovering that the boy has great power in him, his aunt trains him in magic. When his village is attacked by Kargish invaders Duny uses his power to summon a fog to conceal his village. Hearing of this, the powerful mage Ogion takes him as an apprentice, giving him his "true name"—Ged. Ogion tries to teach Ged about the "equilibrium", the concept that magic can upset the natural order of the world if used improperly. In an attempt to impress a girl he meets, Ged searches Ogion's spell-books and inadvertently summons a strange shadow, which is banished by Ogion. Sensing Ged's impatience to learn, Ogion sends Ged to attend a school for wizards on the island of Roke. At the school, Ged's skills inspire admiration among the teachers as well as students. He befriends an older student named Vetch, but generally remains aloof from his fellows. Another student, Jasper, acts condescendingly towards Ged and provokes the latter's proud nature. After Jasper needles Ged during a feast, Ged challenges him to a duel. He casts a powerful spell intended to raise the spirit of a dead woman, but the spell goes awry and releases a shadow creature, which attacks Ged and scars his face. The Archmage Nemmerle banishes the shadow and saves Ged's life, although it costs Nemmerle his own. Ged spends many months healing before resuming his studies. The new Archmage, Gensher, describes the shadow as an ancient evil that wishes to possess Ged, and warns him that the creature has no name. Ged eventually receives his wizards' staff, and takes up residence in the Ninety Isles, providing the villagers protection from the dragons that live nearby on Pendor, but discovers that he is being pursued by the shadow creature. He sails to Pendor, and uses his knowledge of the dragon's true name to threaten him. The dragon offers to tell Ged the name of the shadow, but Ged instead extracts a promise that the dragon will never threaten the archipelago. Chased by the shadow, Ged flees to Osskil, seeking advice from the stone of the Terrenon. He is attacked on the way by the shadow, which destroys his staff, but Ged escapes into the Court of Terrenon. Serret, the lady of the castle, shows him the stone of Terrenon, and tempts Ged to speak to it, claiming it can give him limitless knowledge and power. Believing the stone harbors an evil spirit, Ged refuses. Realizing that the servants of the stone wish to enslave him, he flees. He is pursued by the stone's minions but transforms into a falcon and flies away. Ged flies back to Ogion on Gont, who crafts a new staff for him. Contrary to Gensher, Ogion insists that all creatures have a name, and advises Ged to confront the shadow creature. Ged pursues the creature in a small sailboat, until it lures him into a fog and wrecks the boat on a reef. Ged recovers with the help of an elderly couple marooned on the island, who give Ged part of a broken bracelet as a gift. Ged patches his boat and escapes the island, pursuing the creature into the East Reach. On the island of Iffish he meets his friend Vetch, who insists on joining him. They journey east far beyond the last known lands before they finally come upon the shadow. Here Ged realizes that the shadow has always been a part of his own spirit. Naming it with his own name, he merges with the shadow creature, understanding and accepting it as part of himself, and thus healing himself. The first edition of the book, published in 1968, was illustrated by Ruth Robbins. The cover illustration was in color, and the interior of the book contained a map of the archipelago of Earthsea. In addition, each chapter had a black-and-white illustration by Robbins, similar to a woodcut image. The images represented topics from each chapter; for instance, the very first image depicted the island of Gont, while the illustration for the chapter "The Dragon of Pendor" pictured a flying dragon. 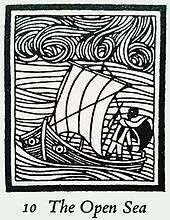 The image shown here depicts Ged sailing in his boat Lookfar, and was used in the 10th chapter, "The Open Sea", in which Ged and Vetch travel from Iffish eastward past all known lands to confront the shadow creature. A Wizard of Earthsea was first published in 1968 by Parnassus Press in Berkeley, a year before The Left Hand of Darkness, Le Guin's watershed work. It was a personal landmark for Le Guin, as it represented her first attempt at writing for children; she had written only a handful of other novels and short stories prior to its publication. The book was also her first attempt at writing fantasy, rather than science-fiction. The book has remained in print for more than three decades, and was released in numerous editions, including a folio edition released in 2015. It was also translated into a number of other languages. An omnibus edition of all of Le Guin's Earthsea works is planned to be released on the 50th anniversary of the publication of A Wizard of Earthsea in 2018. A Wizard of Earthsea was soon followed by The Tombs of Atuan (1970) and The Farthest Shore (1972). The Tombs of Atuan tells of the story of Ged's attempt to make whole the ring of Erreth Akbe, half of which is buried in the tombs of Atuan in the Kargish lands, from where he must steal it. There, he meets the child priestess Tenar, on whom the book focuses. In The Farthest Shore, Ged, who has become Archmage, tries to combat a dwindling of magic across Earthsea, accompanied by Arren, a young prince. The first three books are together seen as the "original trilogy"; in each of these, Ged is shown as trying to heal some imbalance in the world. They were followed by Tehanu (1990), Tales from Earthsea (2001), and The Other Wind (2001), which are sometimes referred to as the "second trilogy". The book has been translated into many languages including Chinese, Hebrew, Indonesian and Russian. The book has garnered acclaim as a work for children. In her 1975 annotated collection Fantasy for Children, British critic Naomi Lewis described it in the following terms: "[It is not] the easiest book for casual browsing, but readers who take the step will find themselves in one of the most important works of fantasy of our time." Similarly, Margaret Esmonde wrote in 1981 that "Le Guin has ... enriched children's literature with what may be its finest high fantasy", while a review in The Guardian said, "The most thrilling, wise and beautiful children's novel ever, it is written in prose as taut and clean as a ship's sail." 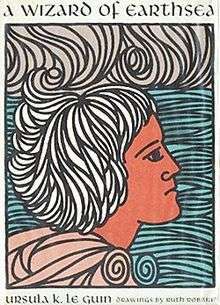 Multiple critics have noted that the Earthsea novels in general received less critical attention because they were considered children's books. Le Guin herself took exception to this treatment of children's literature, describing it as "adult chauvinist piggery". In 1976, literary scholar George Slusser criticized the "silly publication classification designating the original series as 'children's literature'". Barbara Bucknall stated that "Le Guin was not writing for young children when she wrote these fantasies, nor yet for adults. She was writing for 'older kids.' But in fact she can be read, like Tolkien, by ten-year-olds and by adults. These stories are ageless because they deal with problems that confront us at any age." Initial recognition for the book was among children's-book critics, and only later did it get attention from a more general audience. Margaret Atwood said that she saw the book as "a fantasy book for adults", and added that although the book could be categorized as either young adult fiction or as fantasy, but since it dealt with themes such as "life and mortality and who are we as human beings", it could be read and enjoyed by anybody older than twelve. Slusser described the Earthsea cycle as a "work of high style and imagination", and the original trilogy of books a product of "genuine epic vision". In 1974, critic Robert Scholes compared Le Guin's work favorably to that of C. S. Lewis, saying, "Where C. S. Lewis worked out a specifically Christian set of values, Ursula LeGuin works not with a theology but with an ecology, a cosmology, a reverence for the universe as a self-regulating structure." He added that Le Guin's three Earthsea novels were themselves a sufficient legacy for anybody to leave. The book has been seen as widely influential within the genre of fantasy. Margaret Atwood has called A Wizard of Earthsea one of the "wellsprings" of fantasy literature, illustrating Le Guin's influence within the genre. A Wizard of Earthsea has been compared to major works of high fantasy such as J. R. R. Tolkien's The Lord of the Rings and L. Frank Baum's The Wonderful Wizard of Oz. The notion that names can exert power is also present in Hayao Miyazaki's 2001 film Spirited Away; critics have suggested that that idea originated with Le Guin's Earthsea series. Novelist David Mitchell, author of books such as Cloud Atlas, described A Wizard of Earthsea as having a strong influence on him, and said that he felt a desire to "wield words with the same power as Ursula Le Guin." Modern writers have credited A Wizard of Earthsea for introducing the idea of a "wizard school", which would later be made famous by the Harry Potter series of books. Reviewers have also commented that the basic premise of A Wizard of Earthsea, that of a talented boy going to a wizard's school and making an enemy with whom he has a close connection, is also the premise of Harry Potter. Ged also receives a scar from the shadow, which hurts whenever the shadow is near him, just as Harry Potter's scar from Voldemort. Commenting on the similarity, Le Guin said that she did not feel that J. K. Rowling "ripped her off", but that Rowling's books received too much praise for supposed originality, and that Rowling "could have been more gracious about her predecessors. My incredulity was at the critics who found the first book wonderfully original. She has many virtues, but originality isn't one of them. That hurt." Le Guin has also been credited with popularizing the trope of a boy wizard, which is also present in the Harry Potter books. A Wizard of Earthsea focuses on Ged's adolescence and coming of age, and along with the other two works of the original Earthsea trilogy forms a part of Le Guin's dynamic portrayal of the process of growing old. The three novels together follow Ged from youth to old age, each of them also follow the coming of age of a different character. The novel is frequently described as a Bildungsroman. Mike Cadden stated that the book a convincing tale "to a reader as young and possibly as headstrong as Ged, and therefore sympathetic to him". Ged's coming of age is also intertwined with the physical journey he undertakes through the novel. Ged is depicted as being proud and yet unsure of himself in multiple situations: early in his apprenticeship he believes Ogion to be mocking him, and later, at Roke, feels put upon by Jasper. In both cases, he believes that others do not appreciate his greatness, and Le Guin's sympathetic narration does not immediately contradict this belief. Cadden writes that Le Guin allows young readers to sympathize with Ged, and only gradually realize that there is a price to be paid for his actions, as he learns to discipline his magical powers. Similarly, as Ged begins his apprenticeship with Ogion, he imagines that he will be taught mysterious aspects of wizardry, and has visions of transforming himself into other creatures, but gradually comes to see that Ogion's important lessons are those about his own self. The passage at the end of the novel, wherein Ged finally accepts the shadow as a part of himself and is thus released from its terror, has been pointed to by reviewers as a rite of passage. Jeanne Walker, for example, wrote that the rite of passage at the end was an analogue for the entire plot of A Wizard of Earthsea, and that the plot itself plays the role of a rite of passage for an adolescent reader. Walker goes on to say, "The entire action of A Wizard of Earthsea ... portrays the hero's slow realization of what it means to be an individual in society and a self in relation to higher powers. Le Guin described coming of age as the main theme of the book, and wrote in a 1973 essay that she chose that theme since she was writing for an adolescent audience. She stated that "Coming of age ... is a process that took me many years; I finished it, so far as I ever will, at about age thirty-one; and so I feel rather deeply about it. So do most adolescents. It's their main occupation, in fact." She also said that fantasy was best suited as a medium for describing coming of age, because exploring the subconscious was difficult using the language of "rational daily life". The coming of age that Le Guin focused on included not just psychological development, but moral changes as well. Ged needs to recognize the balance between his power and his responsibility to use it well, a recognition which comes as he travels to the stone of Terrenon and sees the temptation that that power represents. Many readers and critics have commented on similarities between Ged's process of growing up and ideas in Jungian psychology. The young Ged has a scary encounter with a shadow creature, which he later realizes is the dark side of himself. It is only after he recognizes and merges with the shadow that he becomes a whole person. Le Guin claimed never to have read Jung before writing the Earthsea novels. But you must not change one thing, one pebble, one grain of sand, until you know what good and evil will follow on that act. The world is in balance, in Equilibrium. A wizard's power of Changing and of Summoning can shake the balance of the world. It is dangerous, that power. It is most perilous. It must follow knowledge, and serve need. To light a candle is to cast a shadow. Le Guin's belief in Taoism is evident through much of the book, especially in her depiction of the "balance". At the end of the novel, Ged, may be seen to embody the Taoist way of life, as he has learned not to act when absolutely necessary. He has also learned that seeming opposites, like light and dark or good and evil, are actually interdependent. that Ged had neither lost nor won but, naming the shadow of his death with his own name, had made himself whole: a man: who, knowing his whole true self, cannot be used or possessed by any power other than himself, and whose life therefore is lived for life's sake and never in the service of ruin, or pain, or hatred, or the dark. Thus, although there are several dark powers in Earthsea (like the dragon, and the stone of Terrenon) the true evil were not these powers or even death, but Ged's actions that went against the balance of nature. This is contrary to conventional Western though, in which light and darkness are considered opposites, and are seen as symbolizing good and evil, which are constantly in conflict. On two different occasions, Ged is tempted to try to defy death and evil, but eventually learns that neither can be eliminated: instead, he chooses not to serve evil, and stops denying death. In Le Guin's fictional universe, to know the true name of an object or a person is to have power over it. Each child is given a true name when they reach puberty, a name which they share only with close friends. Wizards exert their influence over the equilibrium through the use of names, thus linking this theme to Le Guin's depiction of a cosmic balance. According to Cummins, this is Le Guin's way of demonstrating the power of language in shaping reality. Since language is the tool we use for communicating about the environment, she argues that it also allows humans to affect the environment, and the wizards' power to use names symbolizes this. Cummins went on to draw an analogy between the a wizard's use of names to change things with the creative use of words in fictional writing. Several of the dragons in the later Earthsea novels, like Orm Embar and Kalessin, are shown as living openly with their names, which do not give anybody power over them. In A Wizard of Earthsea, however, Ged is shown to have power over Yevaud. Cadden writes that this is because Yevaud still has attachment to riches and material possessions, and is thus bound by the power of his name. A Wizard of Earthsea and other novels of the Earthsea cycle differ notably from Le Guin's early Hainish cycle works, although they were written at a similar time. George Slusser described the Earthsea works as providing a counterweight to the "excessive pessimism" of the Hainish novels. He saw the former as depicting individual action in a favorable light, in contrast to works such as "Vaster than Empires and More Slow". In discussing the style of her fantasy works, Le Guin herself said that in fantasy it was necessary to be clear and direct with language, because there is no known framework for the reader's mind to rest upon. A Wizard of Earthsea has strong elements of an epic; for instance, Ged's place in Earthsea history is described at the very beginning of the book in the following terms: "some say the greatest, and surely the greatest voyager, was the man called Sparrowhawk, who in his day became both dragonlord and Archmage." The story also begins with words from the Earthsea song "The Creation of Éa", which forms a ritualistic beginning to the book. The teller of the story then goes on to say that it is from Ged's youth, thereby establishing context for the rest of the book. In comparison with the protagonists of many of Le Guin's other works, Ged is superficially a typical hero, a mage who sets out on a quest. However, Le Guin also subverted many of the tropes typical to such "monomyths"; the protagonists of her story were all dark-skinned, in comparison to the white-skinned heroes more traditionally used; the Kargish antagonists, in contrast, were white-skinned, a switching of race roles that has been remarked upon by multiple critics. Critics have also cited her use of characters from multiple class backgrounds as a choice subversive to conventional Western fantasy. At the same time, a reviewer commented on the fact that Le Guin, who later became known as a feminist, chose to restrict the use of magic to men and boys in the first volume of Earthsea. Several critics have argued that by combining elements of epic, Bildungsroman, and young adult fiction, Le Guin succeeded in blurring the boundaries of conventional genres. The story often appears to assume that readers are familiar with the geography and history of Earthsea, a technique which allowed Le Guin to avoid exposition: a reviewer wrote that this method "gives Le Guin's world the mysterious depths of Tolkien's, but without his tiresome back-stories and versifying". In keeping with the notion of an epic, the narration switches from looking ahead into Ged's future and looking back into the past of Earthsea. At the same time, Slusser described the mood of the novel as "strange and dreamlike", fluctuating between objective reality and the thoughts in Ged's mind; some of Ged's adversaries are real, while others are phantoms. This narrative technique, which Cadden characterizes as "free indirect discourse" makes the narrator of the book seem sympathetic to the protagonist, and does not distance his thoughts from the reader. A condensed, illustrated version of the first chapter was printed by World Books in the third volume of Childcraft in 1989. In 2011, the work was produced as an unabridged recording performed by Robert Inglis. BBC Radio produced a radioplay version in 1996 narrated by Judi Dench. An original mini-series titled Legend of Earthsea was broadcast in 2005 on the Sci Fi Channel. It is based very loosely on A Wizard of Earthsea and The Tombs of Atuan. Le Guin has stated that she was not pleased with the result, which included "whitewashing Earthsea". Studio Ghibli released an adaptation of the series in 2006 titled Tales from Earthsea. The film very loosely combines elements of the first, third, and fourth books into a new story. Le Guin has commented with displeasure on the results. BBC Radio produced a six-part series adapting the Earthsea novels in 2015, broadcast on Radio 4 Extra. 1 2 3 isfdb 2016. 1 2 3 Slusser 1976, p. 59. 1 2 3 4 Russell 2014. 1 2 3 4 5 6 7 Slusser 1976, pp. 32–35. 1 2 3 4 5 Cadden 2005, pp. 80–81. 1 2 3 Bernardo & Murphy 2006, p. 111. ↑ Cummins 1990, p. 25. 1 2 3 4 5 6 7 8 9 Esmonde 1981. 1 2 Cadden 2005, p. xi. ↑ Le Guin & Wood 1980, p. 41. 1 2 3 Cummins 1990, p. 22. 1 2 3 4 5 6 Cadden 2005, p. 80. 1 2 3 4 5 6 7 8 9 10 11 Griffin 1996. ↑ Spivack 1984a, p. 2. 1 2 Cummins 1990, p. 24. ↑ Cummins 1990, p. 8. 1 2 Cummins 1990, pp. 9–10. 1 2 3 4 5 6 Bernardo & Murphy 2006, p. 97. ↑ Bernardo & Murphy 2006, pp. 98–99. ↑ Slusser 1976, pp. 32–33. 1 2 3 Buffalo 2016. 1 2 3 4 5 Bernardo & Murphy 2006, p. 110. 1 2 3 Cummins 1990, p. 9. ↑ Cadden 2005, pp. 6, 7, 89, 96. ↑ "Search results for 'A Wizard of Earthsea' > 'Ursula K Le Guin' > 'Fiction'". WorldCat. Retrieved 10 October 2016. ↑ Cadden 2005, p. 81. 1 2 3 4 5 Craig 2003. 1 2 Cadden 2005, p. 96. ↑ Cadden 2005, p. 86. ↑ Bernardo & Murphy 2006, p. 5. 1 2 Cadden 2005, p. 91. 1 2 Bernardo & Murphy 2006, p. 99. 1 2 Cadden 2005, pp. 92–93. ↑ Cummins 1990, p. 30. ↑ Cummins 1990, pp. 31–32. 1 2 Cadden 2005, pp. 99–100. 1 2 3 Cummins 1990, pp. 28–29. ↑ Bernardo & Murphy 2006, p. 100. ↑ Cummins 1990, pp. 25–26. ↑ Cummins 1990, p. 26. ↑ Le Guin 2012, p. 51. ↑ Cummins 1990, p. 32. 1 2 3 Slusser 1976, pp. 32–36. 1 2 Slusser 1976, p. 37. ↑ Le Guin 2012, p. 214. ↑ Cummins 1990, p. 37. ↑ Slusser 1976, pp. 37–38. ↑ Cummins 1990, p. 34. ↑ Cummins 1990, p. 36. 1 2 Cummins 1990, p. 27. ↑ Cummins 1990, p. 11. 1 2 Cadden 2005, pp. 108–109. 1 2 3 4 5 Cadden 2005, pp. 86–88. ↑ Rochelle 2001, p. 48. ↑ Rochelle 2001, pp. 48, 53. 1 2 Bernardo & Murphy 2006, p. 107. ↑ Cadden 2005, p. 99. ↑ Slusser 1976, pp. 35–38. ↑ Cadden 2005, pp. 91–93. "Earthsea". BBC. BBC Player Radio. 6 May 2015. Retrieved 2015-07-29. "A Wizard of Earthsea". BBC. BBC Player Radio. 5 January 2011. Retrieved 2011-07-10. Bernardo, Susan M.; Murphy, Graham J. (2006). Ursula K. Le Guin: A Critical Companion (1st ed.). Westport, CT: Greenwood Press. ISBN 0-313-33225-8. "A Wizard of Earthsea". buffalolib.org. Buffalo and Erie county public Library. Retrieved 12 September 2016. Cadden, Mike (2005). Ursula K. Le Guin Beyond Genre: Fiction for Children and Adults (1st ed.). New York, NY: Routledge. ISBN 0-415-99527-2. "The Boy Who Became A Wizard". Childcraft: Stories and poems. World Book, Inc. 1989. pp. 176–187. Craig, Amanda (24 September 2003). "Classic of the month: A Wizard of Earthsea". The Guardian. Retrieved 10 November 2014. Esmonde, Margaret P. (1981). "The Good Witch of the West". Children's Literature. Project MUSE database: The Johns Hopkins University Press. 9: 185–190. doi:10.1353/chl.0.0112. ISSN 1543-3374. Retrieved 28 April 2011. Flood, Alison (15 July 2016). "Ursula K Le Guin to publish Earthsea story in print for first time". The Guardian. Retrieved 13 September 2016. "Zlota Sepulka Winners". goodreads.com. Retrieved 12 September 2016. Griffin, Jan M. (Spring 1996). "Ursula LeGuin's Magical World of Earthsea". The ALAN Review. 23 (3). doi:10.21061/alan.v23i3.a.5. Retrieved 3 September 2016. "Boston Globe–Horn Book Awards – List of past winners". Archived from the original on 19 October 2011. Retrieved 10 November 2014. "Title: A Wizard of Earthsea". The Internet Speculative Fiction Database. Retrieved 30 August 2016. Jaggi, Maya (17 December 2005). "The magician". Guardian Unlimited. London. Retrieved 10 October 2006. Kerridge, Jake (17 November 2015). "The fantasy that inspired David Mitchell". The Telegraph. Retrieved 13 September 2016. Kuznets, Lois R. (1985). ""High Fantasy" in America: A Study of Lloyd Alexander, Ursula Le Guin, and Susan Cooper". The Lion and the Unicorn. 9: 19–35. doi:10.1353/uni.0.0075. Le Guin, Ursula K.; Wood, Susan (1980). The Language of the Night: Essays on Fantasy and Science Fiction. Ultramarine publishing. Le Guin, Ursula (December 16, 2004). "A Whitewashed Earthsea – How the Sci Fi Channel wrecked my books.". slate.com. Retrieved 2011-07-10. Le Guin, Ursula. "A First Response to Gedo Senki.". Archived from the original on 17 July 2011. Retrieved 2011-07-10. Le Guin, Ursula K. (11 September 2012). A Wizard of Earthsea. Houghton Mifflin Harcourt. ISBN 978-0-544-08437-7. Power, Ed (31 July 2016). "Harry Potter and the boy wizard tradition". Retrieved 13 September 2016. Reider, Noriko T (2005). "Spirited Away: Film of the fantastic and evolving Japanese folk symbols.". Film Criticism. 29 (3): 4. Rochelle, Warren G. (2001). Communities of the Heart. Liverpool University Press. Russell, Anna (16 October 2014). "Margaret Atwood Chooses 'A Wizard of Earthsea'". The Wall Street Journal. Retrieved 10 November 2014. "Gold Sepulka". sfif.republika. Retrieved 12 September 2016. Spivack, Charlotte (1984a). Ursula K. Le Guin (1st ed.). Boston, MA: Twayne Publishers. ISBN 0-8057-7393-2. Spivack, Charlotte (1984b). "'Only in Dying, Life': The Dynamics of Old Age in the Fiction of Ursula Le Guin". Modern Language Studies. 14 (3): 43–53. doi:10.2307/3194540. JSTOR 3194540. "A wizard of Earthsea: Inglis, Rob, Le Guin, Ursula K., 1929– : eAudiobook : Toronto Public Library". Torontopubliclibrary.ca. Retrieved 2016-08-29. "A wizard of Earthsea (Audiobook on Cassette, 1992)". WorldCat.org. 2016-08-06. Retrieved 2016-08-29. Bloom, Harold, ed. (1986). Ursula K. Le Guin (Modern Critical Views) (1st ed.). New York, NY: Chelsea House. ISBN 0-87754-659-2. Drout, Michael (2006). Of Sorcerers and Men: Tolkien and the Roots of Modern Fantasy Literature (1st ed.). China: Barnes & Noble. ISBN 978-0-7607-8523-2. Mathews, Richard (2002). Fantasy: The Liberation of Imagination (1st ed.). New York: Routledge. ISBN 0-415-93890-2. Pringle, David (1988). Modern fantasy: the hundred best novels: an English language selection, 1946–1987 (1st ed.). London: Grafton Books. ISBN 0-87226-219-7.